A method of rotary-draw tube-bending that obviates the need for a mandrel assembly by the use of bending dies with heart-shaped cavities. By its nature, non-mandrel bending does not replace bending with conventional bending dies for applications with sufficiently heavy tube walls or large centerline radiuses to eliminate the need for mandrel tooling in the first place. Non-mandrel bending strictly replaces a conventional set-up for that narrow range of applications that normally require a mandrel but are amenable to control at the point of bend under the “pinch” of heart-shaped cavities. In practice this means applications within the range of 1.75- to 3-“D” centerline radius and 12 to 35 in wall factor. Non-mandrel bending compromises bend quality for the benefit of eliminating mandrel and wiper tooling costs. 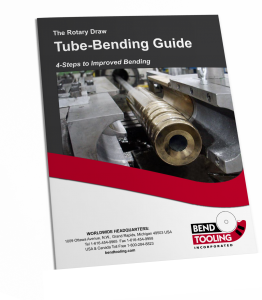 Quality suffers most in terms of the critical attributes of bend reduction and wrinkling, which accounts for the significant decline in the use of non-mandrel bending over the past several years. The problem of wrinkling can sometimes be solved with a wrinkle-control bend die, which see, but customers for bent tubing are increasingly resistant to any wrinkling, controlled or not.